Sounds complicated? Actually, it’s not so hard! 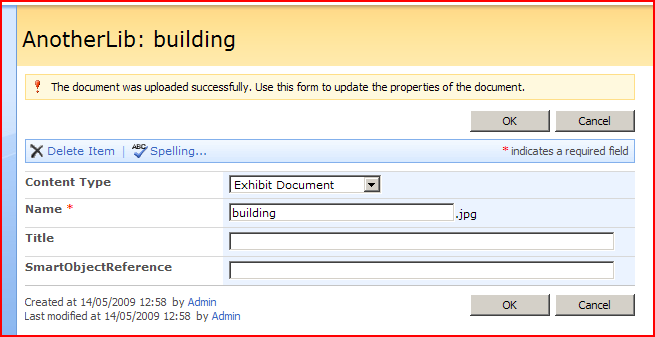 There are two forms involved – Upload.aspx, and EditForm.aspx. It turns out that the Upload.aspx file is actually quite convenient – it will ‘pass on’ any get parameters to the EditForm.aspx following it. The EditForm.aspx also has a nice feature – if you specify a content type (e.g. &ContentTypeId=0x010100... ) it will show that content type when you initially go to the form. Great! So, one final question – how do I stop users manually going into my document library and trying to create my document types that use the ‘SmartObjectReference’ column, ‘cos they won’t be able to fill in the GUID by hand? I tried using the ‘Hidden’ feature from the List’s Schema. This removed the content type from the ‘New’ menu on the list’s toolbar – but not the ‘Content Type’ drop down list on the EditForm.aspx. I’ll work on that some more, but the ‘hidden’ flag in the schema definitely doesn’t seem to do the job, and updating through C#was … problematic. More about that when I’ve figured out what was going on. Next up – user interface to show these documents in our app. Great post Andy! If you don’t mind I’ll add some of this to the sharepointdevwiki? Quite nice. Thanks for the post. I have tried to use your code above as its exactly what I need to to on an EditForm.aspx (although with out attachments). However it does not seem to to work. Do it matter when the javasctrtip code is place on the page? on the line var smartObjRef = $(“:input[title=’Resolution’]”); is ‘Resolution’ the name of the column as defined in Site Settings ? Probably the easiest way to check the name being used is to go to the page and view the source. Something like the IE Dev toolbar can make that much simpler. Check through the inputs on the page until you find the correct one, and check the title. Oh, and your script tags must be full “<script … ></script>” tags. “<script … />” won’t work. I’m a bit confused on how to do this (I think what I did should have worked!). Did I place it in the wrong part of the page? Did I do something wrong in the second part? I’d’ve maybe used one of the content placeholders in the HEAD tag, but that should be a fine location. What this will do is then run your code – but only after the Document is ready. Other than that, it looks fine. I’m trying to fit something very similar into this.. Here trying to change the label text for columns label fields of an editform.aspx, this condition trips and does contain my column name, but the next line does not actually change it.. I suspect because inside a . Sorry new to jquery here. Related to what you are doing here, and how would hide all rows (labels and input controls) that don’t have “#HP#” in the the label (column name)? 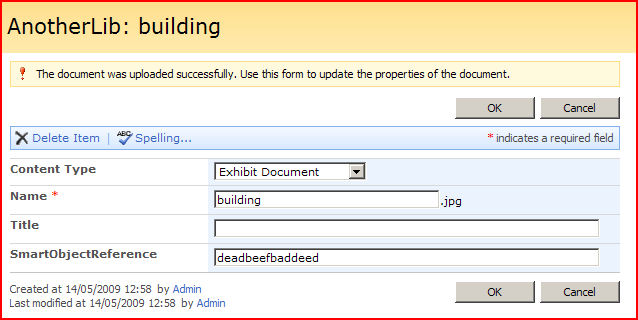 I dont have sharepoint designer stet up. so How to add jqueryscript to ContentEditorWebpart. could you please provide complete script to add it to the contenteditorwebpart. I created custom list and added content types from sharepoint UI. when edit the List items, I want to hide the “Content Type” Field. But its not working .. I am running same issue what you had before. Please let me know How Do I hide the content type drop down on EditForm.aspx page in Custom List. …so I don’t really see anything wrong with what you’ve written Prasad. Are you sure you’ve referenced the jQuery .js library? I’ve a document library in which I’ve associated multiple site content types. In each of these site content type, I’ve a common site column “x”. The weird thing is that when I click to add new item, I don’t see this site column “x” in NewItemForm.aspx whereas it is visible in EditItemForm.aspx. And the same column is visible for all (new, edit, view) forms when referenced through other content types. Can you please give me some useful pointers about how to solve this scenario for this specific content type ? Or are you creating folders in the document library? Upload.aspx will ‘pass on’ any get parameters to the EditForm.aspx following it , but it seems that Upload.aspx sends parameters in non Unicode format . Can you please give me some advice to have Unicode query string parameters in EditForm!